Definition at line 44 of file sampleCompBot.cc. Definition at line 52 of file sampleCompBot.cc. 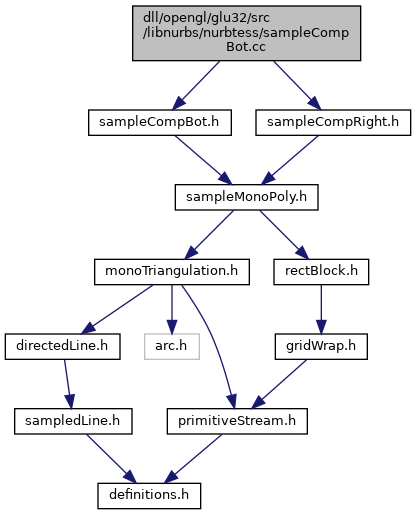 Referenced by sampleBotLeftWithGridLine(), and sampleCompBot(). Definition at line 78 of file sampleCompBot.cc. Referenced by sampleBotRightWithGridLine(), and sampleCompBot(). Definition at line 311 of file sampleCompBot.cc. 341 //if(left(i) is lower than right(j), then the two chains above right(j) are separated. 342 //else the two chains below left(i) are separated. Definition at line 279 of file sampleCompBot.cc. Definition at line 232 of file sampleCompBot.cc. Definition at line 193 of file sampleCompBot.cc. Definition at line 107 of file sampleCompBot.cc. 120 if(segIndexPass > rightCorner) //from corner to pass-1 is > u. 125 else //nothing is to the left of u. Definition at line 452 of file sampleCompBot.cc. 623 assert(segLeftPass <= sep_left); //make sure there is a point to the right of u. 665 assert(segRightPass <= sep_right); //make sure there is a point to the left of u. Definition at line 729 of file sampleCompBot.cc. 743 //the plan is to use monotriangulation algorithm.